The Florida Gators (11-7, 3-3) were jolted by a dominant second half performance to beat the Texas A&M Aggies (7-10, 1-5) Tuesday night 81-72. The Gators trailed by 13 points at halftime, but caught fire from beyond the arc to pull off the impressive comeback win. WHAT WENT RIGHT: At the half, it wasn’t looking good for Florida. They fizzled offensively toward the end of the half, and the Aggies shot lights out in the first, resulting in the Gators being down by 13 at the break. But it was very much a tale of two halves in Gainesville Tuesday night. In the final 20-minutes, it all came together for the Gators on both sides of the ball. The Gators were able to make 11 three-pointers in the second half as they caught the hot-hand and never looked back. The Gators were incredibly efficient in the final 20-minutes of the game, shooting 54% from the field. WHO STOLE THE SHOW: He came into Tuesday night’s game in a zone, and much was the same for KeVaughn Allen against the Aggies. The senior scored 31, a season-high for the Gators, which included an 8-10 shooting performance from beyond the arc. And speaking of three-point shooting for the Gators, it’s no secret that Noah Locke can shoot the deep-ball. Much was the case for the freshman Tuesday night, as Locke contributed 27 points of his own, including seven three-pointers, with six coming in the second half. 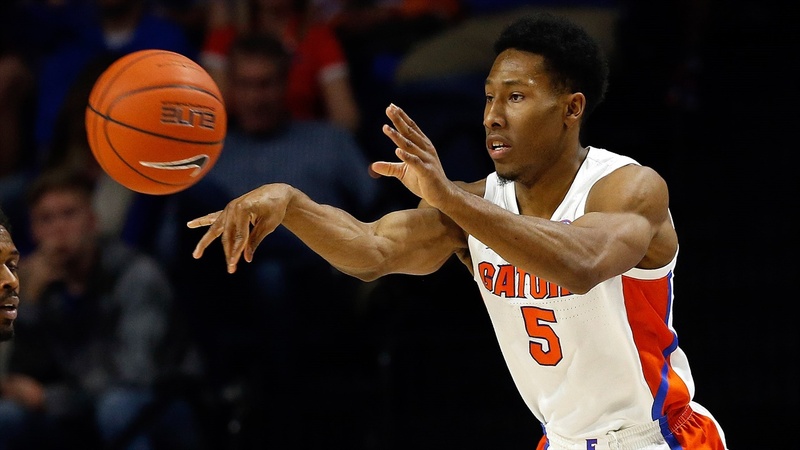 At one point during the Gators critical second half run to get back in the game, Locke made back-to-back-to-back three-pointers. Allen and Locke were instrumental in the Gators comeback over the Aggies. The sharpshooting duo combined for 37 points in second half. NUMBERS DON’T LIE: They’ve already been mentioned for stealing the show, but KeVaughn Allen and Noah Locke simply took over the game in the second. The two finished with a combined for 58 points, highlighted by their combined 15 three-pointers. The two were in a zone in the second half and the Gators did a good job of finding their sharpshooters. To put more of an onus on the stellar shooting from the duo, the Gators finished with 18 three-pointers for the game. As mentioned, Allen and Locke combined for 15 of those, as the basket was looking awfully large for the two of them in the second half. BOTTOM LINE: The Gators got it done in the second half, which may have been their best 20-minutes of the season. Now, it’s important to build off this come from behind victory as the Gators look to continue to build their resume. The inspired second-half effort given by the Gators was key to erasing the 13-point deficit they faced at the half. After the strong showing in the final 20-minutes the Gators showed what they were capable of as a team. They may have been the home team, but coming back from down double-digits in the SEC is an impressive feat. Now the question remains, can the Gators build off the strong comeback showing and maintain their level of play? UP NEXT: The Gators will get a short break from conference play, as they will next travel to Fort Worth, Texas to face the strong TCU Horned Frogs (13-4, 2-3). The teams will meet as part of the SEC/BIG 12 Challenge. The Gators have won their last three games in the SEC/BIG 12 Challenge. Dominant. Have we no proof-readers on this site? Thank you for catching that. It is 100% on me to find and correct.